UPDATE 4/26/17: Somehow in conjunction with the New Religion “March For Science,” Pee Wee Herman impersonator Nye and his show go to a place the rational won’t recognize. A nihilist applauding complete gibberish and pointless obscenity will. 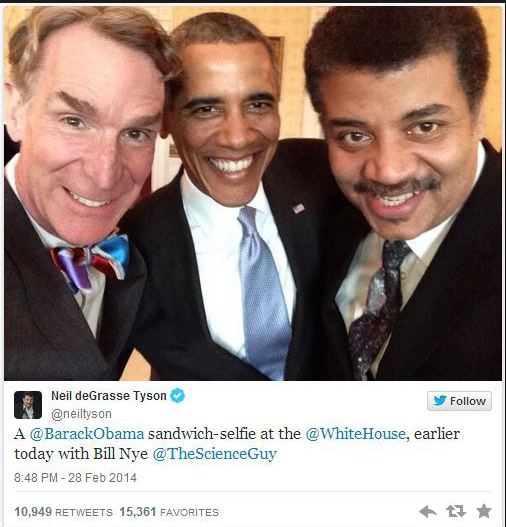 Bill Nye, pseudo-scientist, Neil DeGrasse Tyson’s bookend comrade in Progressive science propaganda. What a coincidence the two of them find themselves stuck like glue to their Propagandist-In-Chief. BFF’s forever…we repeat: Cimate Change baaad! ISIS? Not as bad. The masses as always are eager to be played by high-paid conmen like this trio. Ironically, the breathtakingly stupid masses these days aren’t living in trailer parks and in sore need of dental work. Au contraire, they’re our well-heeled, self-proclaimed intellectual superiors, bred like fruit flies in our most elite colleges and other centers of Uber-Thought. We all know them in our daily lives. How can this be? What’s with this delusional Henny Penny/Chicken Little Globaloney that’s become the Body Snatcher saga of our era? One can only suppose it has to do with the Liberal/Progressive’s irresistible urge to control and be controlled. The rest of us would rather not, but that’s the real point, isn’t it? We are not entitled to our free choice. Our betters know better.